Sun and Soil Juice Company opening in Sacramento! July 6th Summer Blowout For Metal Jewelry! Visit Alpha on July 13th (10:00 am) to try your hand at throwing a clay pot on one of our twelve potter’s wheels. If throwing on the wheel isn’t your deal, stop by and let our experienced studio artists show you how to hand build a clay sculpture. Or just stop by for a Free Root Beer float and enjoy the art.During the event, the artists will be working on their latest creations and demonstrating on the wheel. There will also be a live Raku firing! Now is your chance to have a Free family creative clay day.You will be able to meet our talented studio artists and view their finished ceramic pieces in Alpha’s Fine Art Gallery. 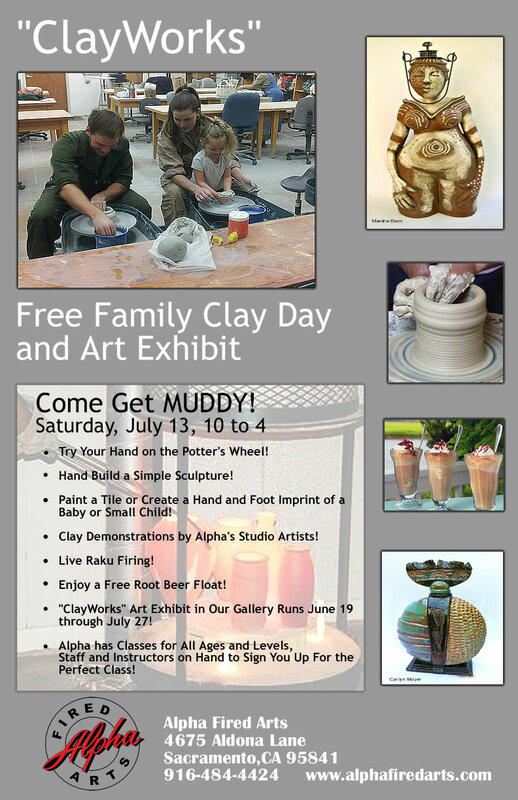 The “ClayWorks” art exhibit runs June 19th – July 27th.Alpha’s “Family Day” is an opportunity to get you and your kids’ hands MUDDY! In our Paint Your Own Pottery Studio, you can paint a tile or create a hand and foot imprint memory of your baby or small child for free. Try playing with some clay, then if you want to learn more, Alpha has classes for all ages and levels. Staff and instructors will be on hand to sign you up for the perfect class.Alpha Fired Arts is the leader of the ceramic community, not only for supplies and materials, but for promoting the benefits of clay art instruction for kids. Alpha provides educational resources for teachers and schools in the area.Visit our website www.AlphaFiredArts.com or call 916.484.4422 for more information. We also offer “Paint Your Own Pottery”!